A common frustration among business executives is that they’re spending all this money on computers for their employees and they keep having to replace them sooner than expected. Sometimes it’s because the computer’s performance has slowed down to a crawl and is hindering productivity; other times, the computer breaks due to rough treatment. Regardless of the reason, you want to get the most out of your investment and extend the life as long as possible. After all, computers aren’t cheap and replacing them is no fun. We get it. What is a roadblock but something that stops you from going forward. You might be able to see your destination, or at least the next leg of your journey from this stopping place, but there is no way forward. You’re stuck. This is what happens in some businesses when they strive to meet their goals. The destination is envisioned, the course determined, but progress is never made. When it comes to business success, roadblocks can actually be technology roadblocks, and fortunately, managed IT services can take these roadblocks down. For those who may not know, I travel all over Southern California, and a good part of the United States, consulting with executives regarding IT Department performance. At some point during these executive discussions, the subject of cost comes to the forefront of the conversation. I really enjoy discussing the cost of the IT Department because it is usually a highly sensitive area and tends to be lumped into one number. The CFO of a distribution company in Los Angeles recently engaged me to help him with an IT department cost comparison. Here in Southern California, we take it for granted that growing season extends throughout the year. Did you know that our state leads the nation in agricultural production? Food grown here makes its way to grocery stores and food processors, not only all over the country, but all over the world. The reason why California has been able to become an agricultural leader is largely due to the climate, and conditions that are conducive to growth. As you seek to grow your business, it’s vital that you create conditions that are conducive to business growth. Here are seven ways that managed IT services helps you to do that. A CFO was reviewing IT costs and decided that he was not going to move ahead with his managed IT service provider’s recommendation to patch their server's operating system software. The CFO was responsible for overseeing IT and his advisors explained the role that software patches and updates played in their overall security. Yet, when looking at the numbers, the CFO wanted to scale back their IT agreement to cut costs and decided to scratch that line item. After all, the managed IT service provider (MSP) was providing unlimited support so they would take care of them if they had a breach. Right? Wrong. If you’re looking at your options for IT support and asking yourself if you should go with in-house IT or managed IT services, you might be asking the wrong question. A better question to ask would be: How should we staff the IT function of our business so we have the right capability in our IT department? The reason why this may be a better question is because gaps in your IT capability can create roadblocks that stifle your business success. Whether you follow basketball or not, you might have heard about Zion Williamson’s shoe blowout, 33 seconds into the February 20th game between Duke and the University of North Carolina. Williamson, a freshman who plays forward for Duke and is the projected #1 overall pick in the upcoming NBA draft, fell to the floor when his Nike shoe ripped apart. The result was a mild knee sprain that took him out of the game. Have you ever been in a relationship where one person was the giver and the other was the taker? It doesn’t work. The word “relationship” implies two-way communication and the desire to put some energy into your connection. Relationship is the perfect word to use when you’re talking about managed IT services because, if you pick the right company, your provider isn’t just going to be your IT support vendor; they’re going to be your IT business partner. Read on to understand what we’re talking about. Many executives don’t think they have unmanaged IT but they do. For whatever reason – to save money, for self-reliance, or lack of knowledge -- they decided that it would be better to cobble together their own mix of technology services and tools, rather than contract with a managed IT service provider to meet their IT needs. Chances are good that the outcome of their custom mix has not met expectations, and IT has become an increasingly frustrating obstacle that the whole business has to bump into every day. Is Your IT Department Destined For Failure? Executives and Information Technology personnel historically have a difficult time seeing eye to eye. 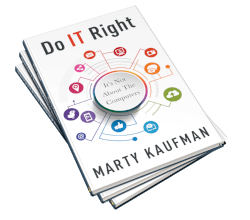 Many executives see the IT department as a necessary evil – you need it to keep the business running, but it’s just expensive and doesn’t add value to the organization. IT professionals frequently get a bad rap, which is unfair because in many cases they are destined for failure.